If there is one area of my collection that is most lacking it is my rookie card collection. I can't quite explain why I never really card about collecting the rookie cards of my favorite players but I just never did when I was first collecting cards as a kid. This series will attempt to right those wrongs as we will focus on rookie cards and nothing else. For today's entry we have Jim Abbott's rookie cards from 1988 Topps Traded. 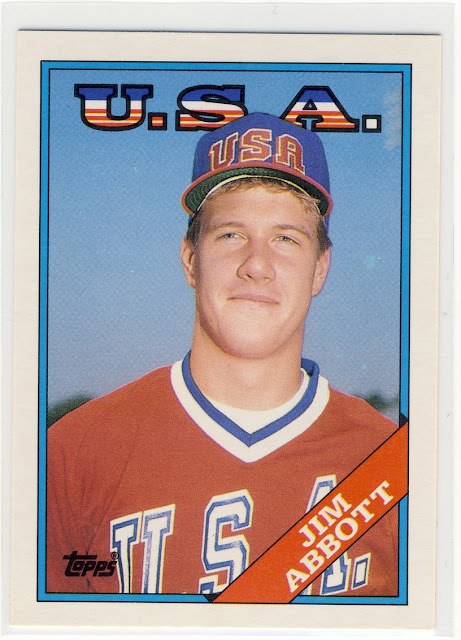 Jim was one of the stars of the 1988 USA baseball team that won the Gold Medal at the Olympics...well, it wasn't an official gold medal because baseball was a demonstration sport that year. Jim was the winning pitcher in the championship game, leading him to be drafted as the 8th pick in the 1988 draft. Matt - get me a list of some of the guys you want to add to your collection and we can work a deal out. Basically all I have are rookies, and I bet we will have some guys I could part with from my box of memories.